Proud to show you what we have been working on! Introducing the Acorn Health Rehab Room! This room has been designed with your needs in mind- we have a treatment couch for any hands-on care you may require, plus a range of rehabilitation equipment designed to help you learn how to strengthen and stabilise your body to prevent recurrence of any injuries. Our rehab sessions are run by our two chiropractors who have specialist training in helping you recover from pain and injuries. Rehabilitation sessions are designed not only to help you recover but to teach you how to care for your body in the future. We are thrilled to be able to offer specialist rehabilitation as part of our chiropractic treatment programmes as we continue to work to provide you with the very best care available. To book your rehab session, please call us on 01243 379693. Plantar fasciitis- can chiropractic care help me? Plantar fasciitis is a common cause of heel pain, and can be incredibly painful. 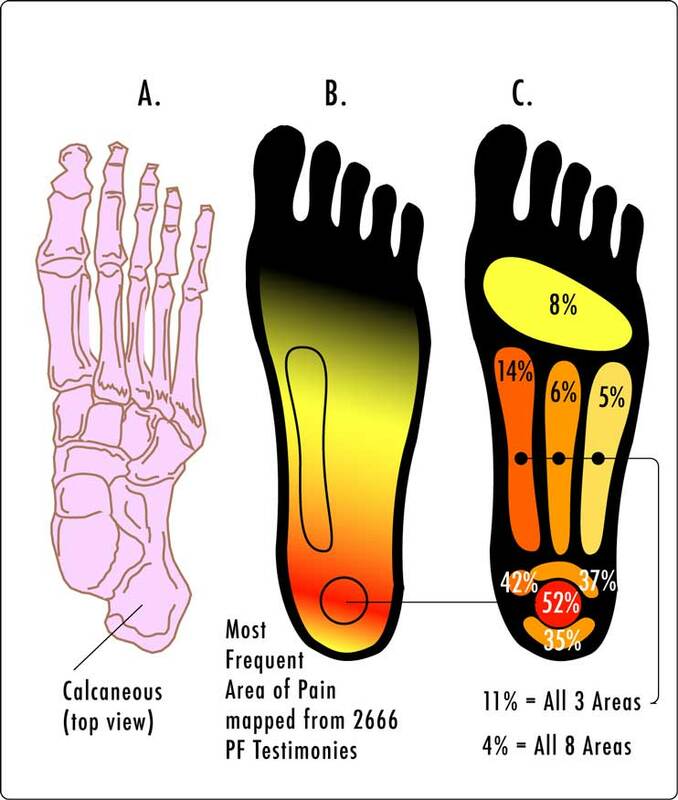 Our patients typically present with pain under the heel which radiates along the underside of the foot. Quite often, the pain is worst when getting out of bed in the morning. You may also have pain when trying to stretch up. The pain is caused by tiny microtears, scarring and a breakdown of collagen where the plantar fascia attaches on to the heel bone. Stretching doesn’t work the way we think it does. At all. If you’ve ever spent your time gritting your teeth, pulling your arms or legs or (eek) neck into weird and wonderful positions to feel that pull, before noticing that a few hours later they’re back to where they were before, you’ll know that stretching doesn’t make your muscles stretchy. To understand why stretching isn’t the key to flexibility, we first have to understand a bit more about how and why our muscles stretch in the first place. All humans have a reflex in our nervous system called the myotatic reflex. Believe it or not- you’ve probably had this tested without even knowing it. It’s the one we activate when we use a reflex hammer to hit just below your knee which makes your leg jump, or the one just above the elbow which does the same to your arm. 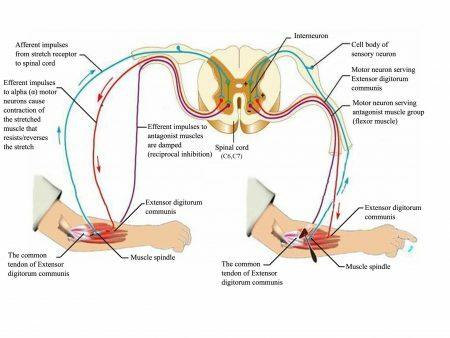 This reflex is the body’s pre-programmed response to a stretch stimulus in the muscle. When the muscle is stretched (as in when hit by the reflex hammer), an impulse is sent to the spinal cord to contract that muscle (and relax the muscle that works in opposition to it), causing the limb being tested to jump. These reflexes are what are called “monosynaptic” as there is only one junction for any signal to pass through before the body sends a response (the message going in->junction->message coming back happens in the spinal cord, bypassing the brain to make sure the response happens quickly) Think how rapidly your knee jumps when it’s hit by the reflex hammer- it’s usually just 1-2 milliseconds before the body responds. What else do reflexes do? Well, they also stop us from falling over all the time. Stand up for a second. Now lean over. As far over to one side as you can go. What happens? The muscles on the opposite side to the lean become stretched, and that reflex is activated again, telling those muscles to contract in order to correct your posture and stop you toppling over. Now, this is a more obvious demonstration of how reflexes maintain our posture, and these postural corrections are generally carried out subconsciously (so we don’t spend all day feeling like we’re going to fall over!) It’s one of those things that we notice more when it stops working. So what do reflexes have to do with stretching my tight muscles? When we activate stretch receptors in the muscle, the message the body receives is to contract that muscle to prevent overstretch. So the usual static stretching that we do (for example when we bring our foot up behind us and grab on to it to stretch our quadriceps) puts our conscious and subconscious brain into war against each other. You’re consciously grabbing that foot to pull that muscle into a stretched position, and your stretch reflex (the subconscious brain) is automatically kicking in (as reflexes do) saying “No!” and tries to stop you from over-stretching and causing yourself an injury. What do we tend to do in this situation? Most people say “oooh that’s tight!” and promptly pull harder… Static stretching has actually been shown to decrease strength and athletic performance, while failing to reduce risk of injury to any significant degree. Why does stretching feel so good then? There are a few reasons why stretching might make you feel like you’re getting somewhere. One: If you continually statically stretch your muscles, you can cause that stretch reflex to become less active. This can mean the muscles do lengthen, but only for a little while. Give it an hour or two for that reflex to go back to normal and the muscles will tighten back up again. This can cause problems for athletes- static stretching means the muscle is unable to contract properly because those muscle spindles aren’t functioning right. 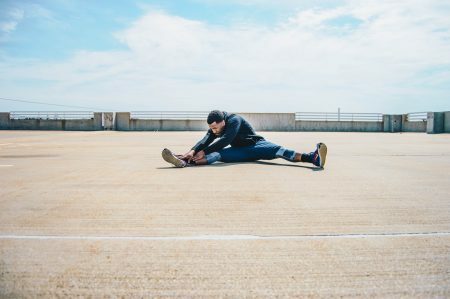 There’s plenty of research out there to show that static stretching before exercise can reduce your muscle strength, power, performance and joint stability. Two: The more we stretch, the better we’re able to tolerate the sensation of “pulling” in our muscles. Yep, we’ve all said it “Ooooh, that’s a good stretch!” That temporary lengthening and release does feel good, but not for long. Three: Pull a muscle or tendon enough, and you’ll begin to stretch your ligaments. Ligaments can, over time, then become stretched out to the point where they’re unable to function properly, resulting in joints that move too much, and are unstable. When ligaments get to this point, they might never regain their original length and strength. 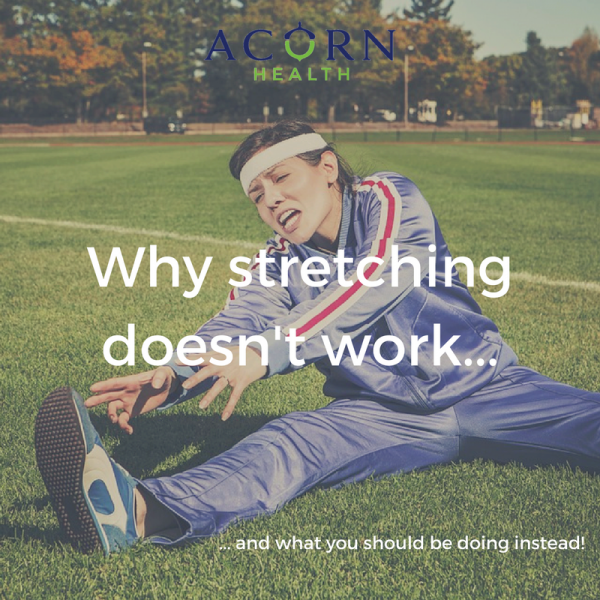 Stretching- Will it get you out of pain? In a nutshell, no. The nervous system rules the road. It’s totally in charge of everything that we do. If you’ve had treatment with me, you’ve probably heard me talk about the reasons why the brain can cause our joints to stiffen and feel like they’re “locked up”. It’s your brain’s way of stabilising an area that it perceives to be at risk of injury (whether that perception is founded in fact or fiction!) So on a very fundamental level, if your brain still perceives there’s an issue in that area, no amount of pulling on your muscles is going to change that. Equally,if the muscle is tight and sore because there’s a joint somewhere that’s misbehaving and preventing the muscle from functioning as it should, then stretching isn’t going to do much for that problem. The process that tells us how tense our muscles should be at rest (known as “resting muscle tone”) is called the alpha-gamma feedback loop and it’s a lot more intelligent than we give it credit for when we’re yanking on our body to get it to stretch. In order to reset an over-enthusiastic resting muscle tone, we need slow, controlled movement which provides vital sensory feedback, allowing this system to reset itself. This makes it fairly clear that pulling our muscles into, or beyond, their stretch capacity does little other than provide a temporary increase in muscle length which then rebounds when those muscle spindles reset, giving you little more than temporary relief from pain and probably serving to prolong your discomfort by making your muscles tighter overall. So how do we make muscles stretchy without stretching? First we have to look at what’s causing the muscle tension in the first place. Let’s look at the hip joint as an example. It’s got anywhere between 170 to 200 degrees of flexion and 40-60 degrees of extension, so is well over the 180 degrees needed to do the splits. So aside from structural changes in the hip joint, is mainly restriction in the soft tissues that stops most of us from being able to pop the splits whenever we fancy. No amount of stretching or “bouncing” into the splits is going to get you there- for whatever reason, the muscles you need to do the splits are activating way before their supposed maximum load and your brain is telling those muscle spindles to stop before you hurt yourself. We have to stop thinking that we can teach our muscles anything. Our muscles don’t call the shots- our brain does. If a muscle gets tight, it’s because the brain is telling it to contract. So if stretching isn’t the answer, what is? Chiropractic care to correct the cause of the problem- We find, assess, diagnose and treat the underlying reason for the muscle tension. If you don’t know why they’re tight, how can you possibly get them better? Foam rolling. It’s not just rolling about on the floor (although that helps!) Foam rolling activates a different receptor in the muscle (called the Golgi Tendon Organs) which sit at the junction between your muscles and tendons. When we foam roller correctly, we stimulate these GTO’s which encourage the muscle spindle activity to calm down, helping to decrease muscle tension, reduce pain and improve function. Functional movement. Simply put, warm up based on movements you actually do in real life. How often do you actually grab your neck and pull it into a weird angle in real life? Not often. If you’re a runner, instead of doing straddle-stretches or the good old foot-behind-your-bum-and-pull stretch for the quads, try lunges, high knees and skipping instead to replicate the movement you’re going to do. So there you have it. Stretching tight muscle tissue will only make it tighter. Find and correct the reason for the tension and enjoy super-supple muscles instead! Protect Your Neck – Tuck your chin in and put your tongue on the roof of your mouth when you do crunches. It will help align your head properly, which helps reduce neck strain. Don’t exercise when you’re sick – You’re better taking a day off so your body will use its resources to heal itself, not build muscle and endurance. If you want to exercise before work but aren’t a morning person, try this trick: For a set period, let’s say 4 weeks, force yourself to get up 15 minutes earlier than normal and go outside for a quick walk. Make it so easy that you don’t even have to change into your workout clothes. As you near the end of the 4 weeks, you’ll have a new habit and will then be able to progress to either longer walks or a run in the morning! Improve your balance – Stand one-legged on a sofa cushion and move a medicine ball (or heavy phone book) from hand to hand, side to side, and behind your head. Once you’ve mastered the move, try it with your eyes closed. This technique will improve your balance, coordination, and body control, all important athletic attributes. Run Injury-Free – One week out of every six, cut your weekly training mileage and frequency in half. You’ll give your body a better chance to recover, and you’ll avoid permanent, nagging injuries. Find out more in our Running without pain resource. Run Hills Faster – When running uphill, keep your head up and your eyes focused on the top of the hill. This opens your airways, making it easier to breathe than if your upper body were hunched forward. Find out more in our Training, Injury prevention and recovery resource. Replace Your Shoes (Not Your Knees) – To avoid injuries, write an “expiration date” on your shoes as soon as you buy them. Shoes last about 500 miles, so simply divide 500 by your average weekly mileage to determine how many weeks your shoes are likely to last. End Back Pain – For every set of abdominal exercises you perform, do a set of lower-back exercises. Focusing only on your abs can lead to poor posture and lower-back pain.